I found this teddy bear the other day, face-planted at the side of the street like a victim in some fuzzy version of CSI. He was found near the corner of Eugenia and Bocana. I turned him over and melted a little bit: he’s filthy from his time on the street, but obviously well loved. Given my own daughter’s attachment to her stuffed BFF – a linen-pants-wearing toad named Lewis – I decided to pick up the bear and try to get him his family back. 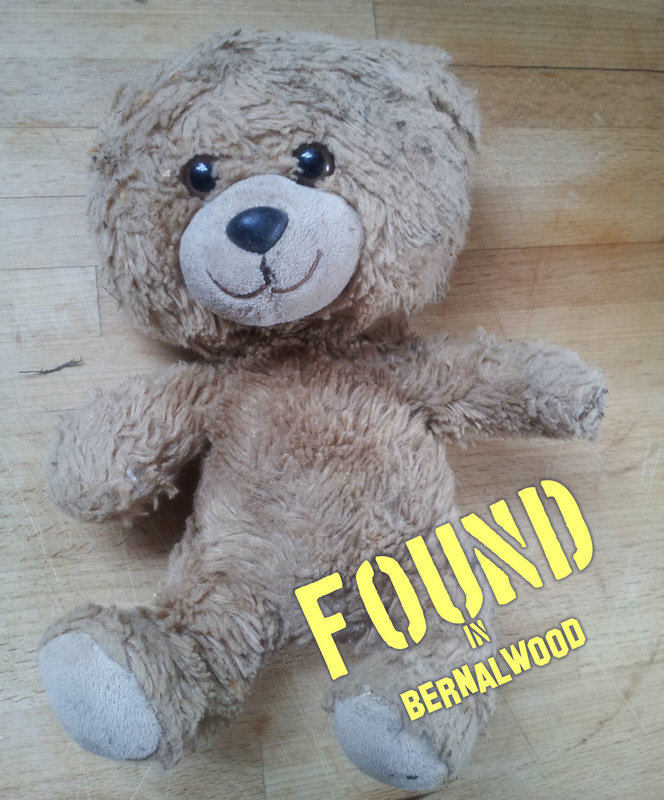 If this was your teddy bear, please contact the Bernalwood Lost Stuffie Hotline at bernalwood at gmail dot com to restore wholeness to the universe. I too once found a tattered Winnie the Pooh face down in the busy streets of Toronto Canada. There was a faded telephone # that was too worn to read. Sadly he wasn’t reunited but he remains here with me. If you can’t find your lost bears owner, I would gladly adopt him and give him a wonderful home!